Hey all! I'm back again with another blogging tips post. They seem to have become a regular thing recently which you seem to love, so I think I'll try and share at least one a week from now on. 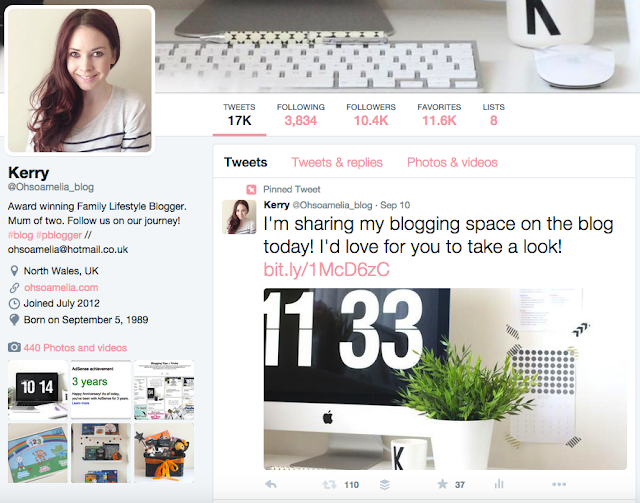 Todays post is all about how to grow your blog with Twitter! I've always had a love/hate relationship with Twitter, that was until earlier this year! I started using it correctly and have definitely seen an improvement in my stats and I now really love using it! In fact I may have to say it's become my favourite social media platform (after Instagram of course!). There were so many things I was doing wrong on Twitter, one of them was that I wasn't actually engaging with my followers! Sounds pretty silly right, especially as it's a social media platform but I was only sharing my content on there and wasn't actually engaging with people or getting involved in the conversation. Since I started implementing these tips around, I have seen an increase in my followers (on average 500 new followers a month), around 10,000 profile visits, 1500 mentions and 200k tweet impressions. 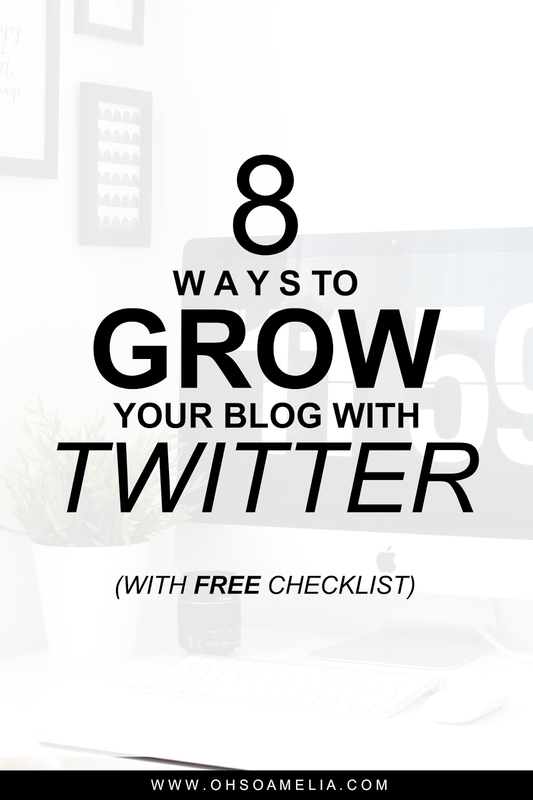 Here are 8 things you can do to grow your blog with Twitter. They may not all work immediately but give it time and I promise you if you weren't already doing these then you will see an improvement in your stats in a matter of weeks! It's no secret that the more followers you have, the greater your influence. Well for the most part anyway. However, you may have thousands of Twitter followers but no engagement with your readers. If you're using Twitter for your blog, it's not enough just to tweet your own posts. You need to take the time to engage with what other people are saying. Spend 5-10 minutes at a time to scroll through your feed a few times a day and favourite, retweet and reply to comments or questions other people have asked. By doing this you are not only engaging with other people but you're also getting your own account seen, which will result in new followers and potential new readers on your blog. You can start this right now, go on... how about starting up a conversation with someone who you've not spoken with before or in a long time. This is one of my absolute pet peeves of Twitter, I actually hate seeing tweets to blog posts with no image! I honestly just scroll past them and never click on the link, they're not inviting at all and definitely don't get my interest. By having an image you're instantly drawing the reader in as they're scrolling down their feed. What are you most likely to click on? A tweet to a post with a few words or an image of some mouthwatering chocolate sundae. It doesn't even take that much longer to add one in. Trust me, you'll start seeing more results. I don't even retweet these posts and only tend to retweet tweets with an image as that's whats caught my eye whilst scrolling down my Twitter feed. Of course it's good to have a varied and interesting feed so make sure you have a mix of text, link and photo updates to offer your readers variety but for the blog posts you really want to promote I'd recommend using an image. Using hashtags (#blogger #blogtips #pblogger) in your Tweets allows your posts to be seen by more potential readers should someone be searching for that hashtag. Keep an eye on what's treading so you can jump in on the bandwagon and join in with the conversation of hot topics when relevant, sometimes Twitter chats end up trending so it's always good to get involved with those when they do. Make sure you keep your hashtags relevant to the post you are Tweeting about. If you're not sure which hashtags could be relevant to your post check out Hashtagify which allows you to enter a hashtag to discover which other hashtags may be popular to use. Also, keep hashtags to a minimum 1-3 usually work well, too many can look spammy and leaves you less room to write an engaging title for the tweet. Having a Twitter schedule over the last few months has definitely seen a huge impact in traffic to my blog and increase in new followers. 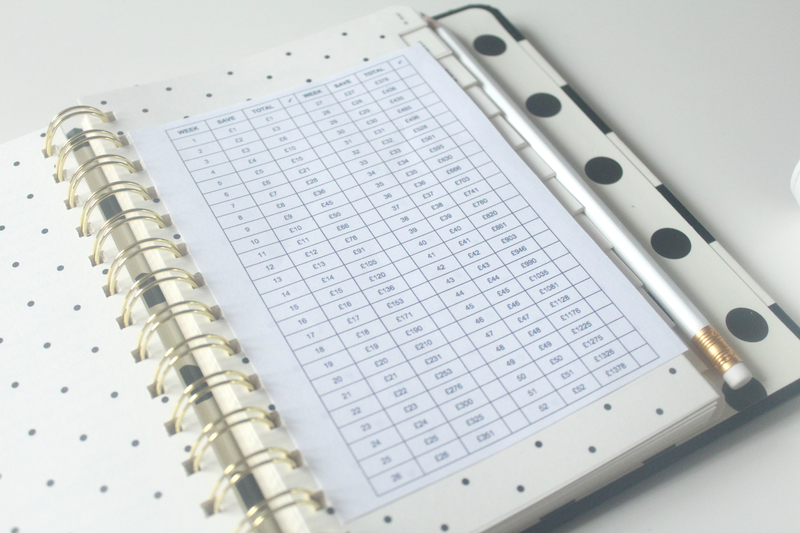 This may not be for everyone but if you like to plan ahead or have checklists then a Twitter schedule may work for you. I use Buffer to schedule my tweets however you can use your preferred scheduling platform whether that be co-schedule, Hootsuite or something else. Have set times your publish your tweets each day, when they will be seen the most. Buffer has a great optimal timing tool where you can see which times are best for posting throughout the day. The best thing about scheduling your tweets is that it means you don't have to be on your phone or laptop all day. I tend to schedule mine at night before bed or first thing in the morning which leaves me with the rest of the day to retweet and respond to mentions whilst I am on the school run, eating lunch or waiting for dinner to be cooked. I've put everything I do daily on Twitter into a little checklist for you. You can download the checklist right here, or by clicking the image above, print it off, or keep it on your desktop handy for when you need it. It's a good idea to mix your own content with that of others when you are Tweeting on Twitter. After all sharing is caring! Try and divide up what you Tweet with personal tweets, self-promotional tweets and re-tweeting other people's content. By mixing things up you are keeping your profile interesting and will gain more followers. You could also take part in a Twitter RT thread on Facebook which are becoming more popular recently or create a tribe and RT each others posts regularly. Twitter allows you to pin a Tweet to your profile so that is one of the first things people will see when they click on your profile. This can be extremely useful when you are wanting to promote something such as a competition, product, course or even just a blog post. To set it up you simply click on the ellipsis icon (...) on the post you wish to pin to your profile page and click "Pin" The above post has been pinned since around the 15th of this month and from looking at the insights has had a total of 10,500 impressions so far along with 110 RT's and 78 clicks to the post itself. Did you know that the font of Tweets which have received more engagement will appear slightly larger than others? This is so your best content is easier to find. Twitter chats are not only a great way of finding new people to follow but it also allows people to find you too! There are so many different Twitter chats on the go these days, keep an eye out for these by using the search option or if you already know of a few then join in! As everyone is required to use the hashtag when tweeting other people taking part can then easily find you. Whilst these chats are running without being spammy, Tweet a couple of your posts and include a hashtag for example #ukbloggers, #lbloggers or something relevant to your post or blog, it's a great way for new readers to find your blog! Here's a great list of Twitter chats to join in with. Find people who share things that interest you and exist within your niche. For example, if you're a beauty blogger, start following all your favourite beauty bloggers, brands and PR outlets that work with beauty blogger or are related in some way. This can also be applied for food, fashion, parenting, lifestyle bloggers or what ever your niche may be. By following people you will build up a great network of people who may take an interest in your blog which is a great starting post for gaining new readers or for working together in the future. I hope this gives you some ideas on how you can grow your blog with Twitter, especially if you weren't already doing some of any of these. Don't forget to download the daily Twitter checklist to keep track of your tasks. P.s You can take a look at your Twitter analytics here. Do you have any other tips to share on how Twitter has helped you grow your blog readership and traffic? Let me know in the comments! I'm still getting to grips with Twitter but the last few days I've finally started to "get" it. Weirdly by doing pretty much what you said in your post! I love this series on your blog! I needed to read this! I know that I should be engaging more but I am just not doing it! Fantastic list and thank you for the inspiration! interesting post - I've just started to schedule my blog posts to twitter to my own timeframe so have yet to see if that works for me. Already I'm finding that the time I spend on twitter now is different, as basically I'm not just pushing my own posts. Using a picture is always a must - catches people's eye! I really need to do the pictures for my blog post tweets - not sure why I hadn't really thought of doing that before as it's a really obvious point when you think of it. I've been falling into the exact same twitter traps! 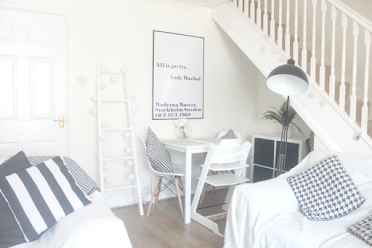 I'm loving these sorts of posts, it's so nice to see bloggers helping each other out. I need to get better at adding images. I'm meant to be on twitter cards which should provide images too, but not too many show up, so instead of sharing from hootsuite or my blog, I need to do it from twitter more. I don't agree with the point about drop a couple of posts in during twitter chats. Usually the host asks for those at the end, so when in a chat, it feels spammy. Awesome! I thought I had read everything on twitter already but I didnt know about the pinned tweets! I have a love hate thing with twitter too! Thanks forbthe checklist!! Fantastic tips! I don't really use twitter that often but I think it will be a good way of growing my blog. I'll check out Hastagify. I love twitter, it's so useful for spreading blog links and cyber meeting really lovely people too. I really must get into scheduling too. I think I'll actually get that sorted tomorrow. Thanks for the tips!! Great tips! I never even thought about adding images to my promotion tweets, will be trying that to see if it helps! Great list! I'm always surprised to see people who aren't using Twitter to grow their blog - these ways can really make a difference! Perfect post sugar! Reminds me I should get my planner up on my site. I haven't got Twitter but I have been thinking for a while to get it in order to increase traffic to my blog. I know how to use Twitter as I have had to run Twitter accounts for companies before but have never been overly keen. Maybe it takes some getting used to? Great tips though. 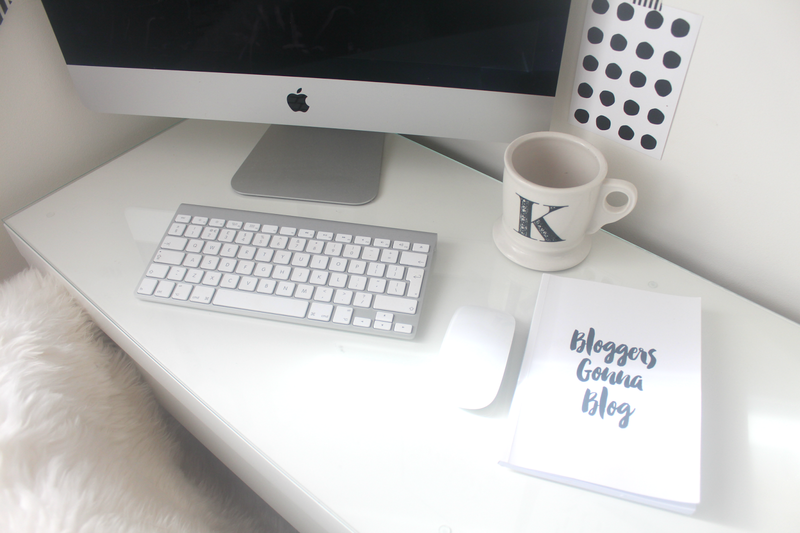 I really love reading your blogging tips series, as ever another really helpful post! Great tips Kerry. I have to agree about the image on a tweet. I was a real badden for not including an image but since I have started doing that I have seen an increase in traffic. Scheduling is so important for me especially with a toddler as it allows me to be active as well as be with my son. Thanks for sharing these tips. I am terrible at using twitter and interacting on it. Great tips, will have to look back at them when I go back to blogging. Well needed! I really wanted to know this, especially about the twitter chats. Thank you for sharing. Super useful tips. Twitter is my Achilles heel in blogging, and I hope I can use these to overcome my twitter-phobia! I really love Twitter, It is definitely my favourite of all the social media channels. I love the speed of twitter and how you can get your post out there and point accross super quick. Thanks for the great blogging tips by the way, loving them! These are really great tips! Thanks so much for sharing!! Thanks for posting this valuable info! I am always posting an image, but I don't think I engage with my followers enough! Twitter is one platform I am yet to experiment... though i have a passive account...would really love to get a hang of it..
Wow this is great info, I have been stagnant on twitter,can't seem to up the game...so this helps so much..thankyou!! I just started my first twitter account a couple of days ago, so this is really very helpful to me. I am not familiar with twitter AT ALL, so I'll be sure to use some of these tips in my future postings. In fact, I really like the idea of re-tweeting other's posts as it seems like a good way to develop relations outside my normal spectrum. Great tips! Some I already new but have gotten lazy about. Thanks for the nudge! These are great tips! I'm pinning it so I can reference it later. Thanks for sharing! Great tips! I've been doing most of these and I can say that my twitter account has been growing steadily. I admit I still have a lot to do, specially when it comes to engaging with followers, but where your tips come in handy. I also have trouble when it comes to relevant hastags, so thanks for the Hashtagify link! I love these twitter tips! I have implemented at least 3 of these recently with my twitter account and I have definitely seen a lot of growth from it. Also the importance of engaging is definitely the most useful tip you have on here. Creating a sense of community is what is going to get the readers to be coming back! 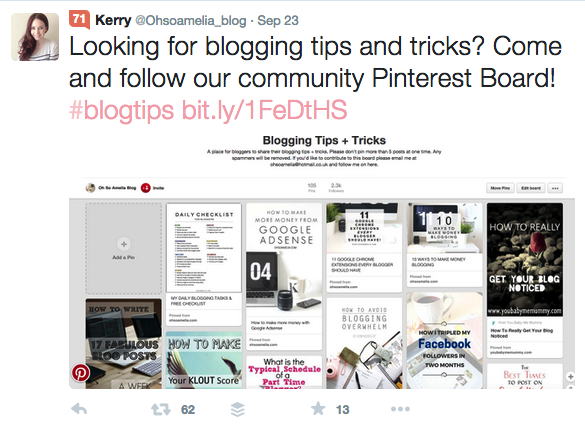 Pinned tweets are a great way to get more exposure to a certain post, promotional or not. Great list, Kerry! great tips! i have been utilizing some of these already and it makes a difference! Fab post. I love twitter but most of my readers are on Facebook. Do you have a similar post about Facebook? Such a hit & miss these days getting the engagement. Valuable suggestions ! Incidentally , if others has been needing to merge two PDF files , my family encountered a service here AltoMerge.com. Some really good info here, as I've struggled with Twitter just plodding along growing very slowly. Few hashtag stuff I didn't know about and the twitter chat schedule is very interesting, thanks! Great advice! I've found there is much more to promoting my blog on Twitter than just following followers. Just a quick thank you for writing this guide. Some really useful advice for a new blogger and twitter duffer! Love the tip about a pinned tweet! Also, advice to use a piccie. Mitzi. Thank you Amelia for writing this blog post for Twitter on how to grow your blog. One automation tool I use to grow my blog on Twitter is Revive Old Posts. It's a WordPress Plugin that has got me massive results! Twitter is my favorite social media platform. Play documents of numerous various styles. iTunes Login login account inquiry to obtain even more details concerning Apple Store login.